so I recently got the opportunity to get a pair of panthers for my birthday this past Sunday! 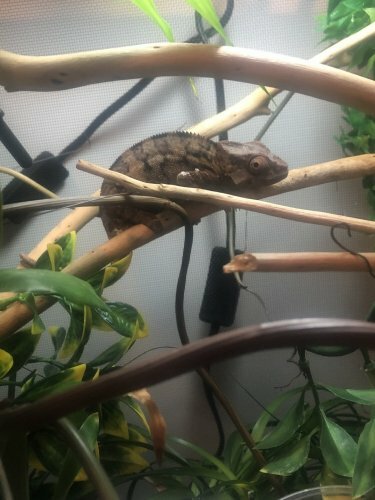 I’ve had experience with some chameleons here and there but never got a panther. 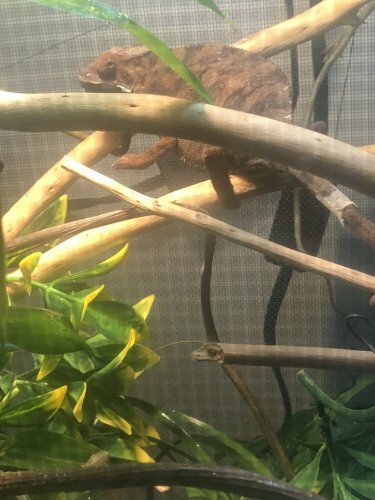 I received a male and female that were both housed in a singular cage and both approx 9 months old. The guy I received them from had them for about 4 or 5 months. 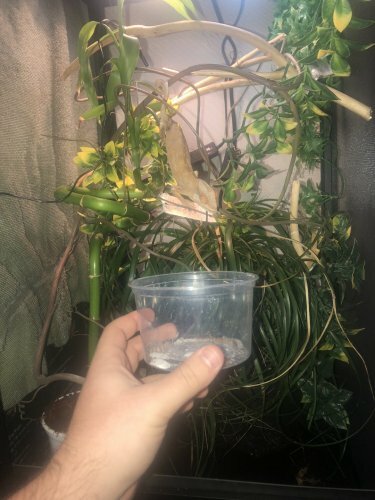 I got them home, I set up two separate cages and added live plants to what he already had. Here’s what I got, let me know if any issues. No known source supplementation was applied. I started dusting with calcium (daily), calcium with d3 (2 times a week)and have a multivitamin (1 time a week). I’d like to just switch to rapashy calcium plus and use that everyday and drop the others. I also blended up various veggies and fruits and froze them into an ice tray to give to insects as gut-load. My concern is that I have dusted the crickets and offered in a cup and they don’t seem interested unless it’s a plan cricket. I offered roaches, super worms, and horn worms. But I’m having troubles. The humidity is not known but I mist 3 times a day heavily and drippers go all day. The pair didn’t look in the greatest shape upon arrival but I don’t think they are beyond turning around at all. Good job on separating them! Basking is a tad high, aim for 85*F. What type of uvb (compact coil or linear) and what strength (5.0, 10.0, 6%, 12%)? Phosphorous free calcium with D3 should be twice monthly (every 2 weeks) and a multivitamin should also be twice monthly (every 2 weeks). What types of fruits and veggies? Do you buy organic or at least wash off non-organic produce very well? How heavy are you dusting the crickets? Could you fill out this form, please? 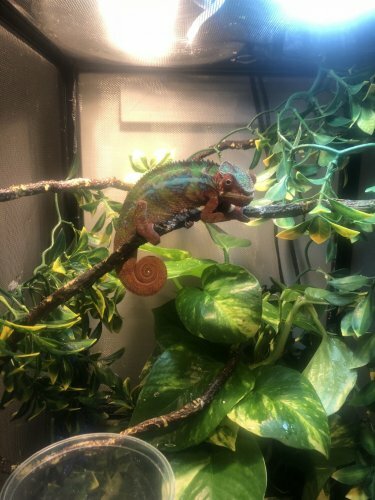 https://www.chameleonforums.com/how-ask-help-66/ Also, the panther care sheet here is super resourceful. Be aware that females have separate requirements from males and need a lay bin, too. 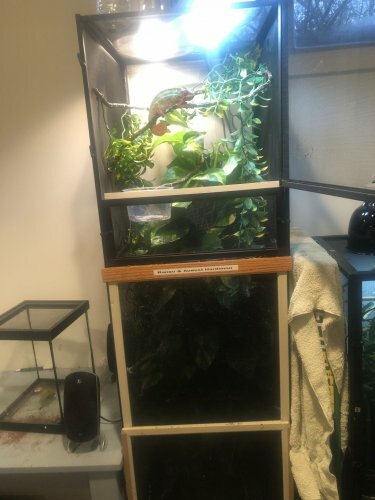 Could you post a pic of each cham and their enclosures, as well, please? Here’s the care sheet. To measure humidity, I got a $5 digital hygrometer/thermometer combo from the hardware store, and I use a digital temp gun to measure basking. 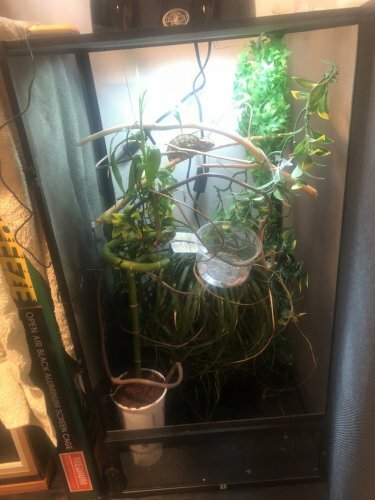 What plants do you have in their cages? Instead of doing multivitamin and d3 twice a month can I switch over to the rapashy calcium plus and Ailey use that? I’ve been told yes. Okay, so males need a minimum of 2’ by 2’ by 4’ tall enclosures, preferably screen, and females need a minimum of 18” by 18” by 36” tall enclosures, preferably screen. You are using compact coil uvbs, and I recommend getting either T8 or t5HO linear uvb bulbs and fixtures, at either 5.0 (Zoo Med) or 6% (Arcadia). Make sure there are plenty of branches and vines, mostly horizontal, everywhere throughout the enclosures. Awesome job on the plants. If the female is dark, she’s probably stressed because they get dark when they’re cold, not hot. Make sure to get lay bin and read up on egg laying, too. Make sure to feed only in the morning so they can digest their food during the second half of the day. So I got out some plain crickets and got the female to eat. She was a nice peach color. Then I misted both cages and she’s sitting under the light dark brown. But I know that basking spot was temping low 90s maybe just some of the water from misting made her mad/cold? No problem, if you have any more question or need help, just let anyone here know and we’ll gladly help!